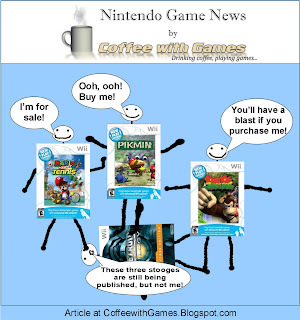 Coffee With Games: Metroid Prime: Trilogy is No Longer Being Published or Shipped!? Metroid Prime: Trilogy is No Longer Being Published or Shipped!? Have you purchased Metroid Prime Trilogy Collector's Edition , if not, you better get a move on it! A few weeks back, I mentioned on one of my blogs, "Metroid Prime: Trilogy, for some reason, isn't in stock on Amazon.com now, and it's only available from 2nd or 3rd party vendors on Amazon.com." I sent a few emails over to Nintendo, inquiring as to why Metroid Prime: Trilogy wasn't in stock on Amazon.com for several weeks in a row. The question in one email was, "Amazon.com hasn't had Metroid Prime: Trilogy in stock for several weeks. Is Metroid Prime: Trilogy still being published, or has production for the game stopped?" The response I received from Nintendo was, "Unfortunately, Metroid Prime Trilogy is no longer being shipped. Having said that, you may be able to find what you seek through the secondhand video game market." For clarification purposes, I sent over another email and asked, "I was told Metroid Prime: Trilogy is not being shipped/published anymore. Is that true? If so, is there any reason why Metroid Prime: Trilogy isn't being shipped/published?" The reply I received from Nintendo was, "Thanks for your e-mail. The earlier response regarding Metroid Prime Trilogy was correct: it is no longer being shipped. When first introduced, it was announced that there would be limited availability. However, a reason for this was not announced. That being said, you may still be able to locate a copy via stores that specialize in previously played or used games." I was curious, because I noticed one of the other New Play Control! games on Amazon.com was also out-of-stock, so I inquired about those games as well. I asked, "Also, are the other New Play Control! titles still being shipped/published, or have they stopped shipping as well? The games I'm referencing are New Play Control! Pikmin, New Play Control! Mario Power Tennis, and New Play Control! Donkey Kong Jungle Beat." To that question, the response from Nintendo was, "As to your second question, additional New Play Control! titles have not been announced. However, the original titles are still being shipped." Being that Metroid Prime Trilogy Collector's Edition isn't being published/shipped anymore, do you plan on purchasing it? Now may be the best time to do so, before it becomes more difficult to locate! Why do you think Nintendo canceled and stopped producing and shipping Metroid Prime Trilogy? Do you think it was simply because it was a "collector's edition", and they'll release the Metroid Prime games individually now as New Play Control! titles? If you're interested in any of the games in this article, you can purchase them off Amazon.com by clicking the links below! Thanks for the comment! I also picked it up from Best Buy when it was on sale for $19.99. I'm glad I didn't wait(still haven't even unwrapped the game yet)! Thanks for the comment! I'm even further behind you, as my game is still wrapped up in the package. I did play and complete Metroid Prime 3: Corruption, on it's own, but traded the game off this past year. So many games, so little time it seems! Thank God I got mine at time. In Latin America its very difficult to get this things, and it seems it will be even harder now. Well... ONE store in Argentina has the game at a super high price. I'm glad I purchased my copy a few weeks back, now if I can just make myself play it! How many copies did Trilogy sell? I don't know if Nintendo released "official" sales numbers(didn't find any), but VGChartz has it around 400,000 sold. Unless we hear from Nintendo, I guess we won't know for sure. seems like a marketing technique to increase demand for a old game. I didn't get it when it came out because I already played them when they were new. too many new games coming out to waste money on this one. I know why because of the package. The metal box was more costly and they did not want to go on once they ran out of metal boxes. They are spcial order metal boxes and require more work to make than plastic and paper. It might come back as a plastic box game. I got mine though and i plan to take good care of it and never sell it. I still got all 3 of the first gamecube and wii disc so I did not even open mine yet. I'm not sure what the plan is, because Nintendo hasn't announced anything about any of the Metroid Prime games, other than Metroid Prime Trilogy Collector's Edition is no long shipping. Also, thanks for the comment. The package could be why they're not making the Collector's Edition anymore. I'm just surprised Nintendo didn't make some sort of announcement, letting gamers know the Collector's Edition was going away. Maybe they will make Metroid Prime Trilogy, just not in the metal case. I'll be interested to find out. I wish I would have picked up a copy when they were on sale now. I had my eye set on a few other games at the time. Hopefully I can still find a copy at a reasonable price. This is something which is really worth reading about. Your article is purely bait-n-switch in order to bring more hits to your website. Your post claims that "Metroid Prime Trilogy" is no longer being published. But you actually then state it is only the collectors edition that is not being published anymore (and this is common a short time after release for any title with a collectors edition). You knew what you were doing when you posted this on n4g.com as well. Sounds like Nintendo thinks they are Disney or something. BASTARDS!! Thanks again for the comment. I was lucky enough to get the game at BestBuy for $20 a few weeks back. It's still out there, I saw it at Target earlier this week, so you should be able to find it still. Thanks for the comment. Cryogenics is beyond my thoughts...all I know is I think it's about freezing stuff to cold temperatures. Thanks for the comment, but please read my response. This was not a "bait-n-switch" at all. Metroid Prime: Trilogy Collector's Edition, is the only Metroid Prime: Trilogy currently being published/shipped in the United States. I live in the United States and emailed Nintendo of America. I guess I could have clarified that in the article, because I didn't think about the NPC! versions in Europe and Japan, because I don't live there. Also, in the replies received from Nintendo of America, neither representative stated anything about another Metroid Prime: Trilogy being released/published to replace the "Collector's Edition". So, if you live in Europe or Japan, I guess this doesn't apply to you until confirmed for those regions. Thanks for the comment. It's funny you mentioned Disney, because I thought the same thing when writing the article...are they putting the game in their "time vault" or something? I just wish they would announce whether Metroid Prime 3: Corruption, or Metroid Prime: Trilogy, will be available in any form now that the "Collector's Edition" isn't being published anymore in North America. Hopefully someone will let me borrow the game, even though it's only $20. What was anyone's favorite out of the 3 primes? Hopefully you can still find this game, because it's actually has a $50 MSRP, not $20...just some people got lucky when Best Buy had the game on sale for $20 a few weeks back. As for your last question, "What was anyone's favorite out of the 3 primes? ", I've only played Metroid Prime 3: Corrupion, and I think the game is excellent, and I personally enjoyed it more than The Legend of Zelda: Twilight Princess and Super Mario Galaxy. For me, Metroid Prime 3: Corruption was well worth $50 by itself alone. I just hope I enjoy the first two as much as I did MP3. I spotted the game for £15 in Sainsbury's (England) just after Christmas in their clearance section. I couldn't believe it. I reckon I'm a fairly typical Wii owner though. When I was a kid, I would have adored all this exploration stuff but as a grown up, it all seem s a bit of an effort. Wii Sports Resort, etc allow me an hour of fun with my family before I/we get on with something else. I'm surprised concerning this. It's probably the first metal package that Nintendo is doing and suddenly, they stop. Thanks I've my copy and where I'm, I'm not supposed to have it : I'm in Quebec and because of a law that prohibit selling games with non-french description. Trilogy is only in english because of the package but I've pre-ordered it so I'm lucky. And yes, it's more enjoyable than Mario Galaxy and Twilight Princess, would be sure more than the next Zelda on Wii. Anyway, go get your Trilogy before it's over! I picked mine up a few days ago when I heard it was probably discontinued. I'm guessing it's because its a collectors edition, no point in calling it that if they were going to sell it like a normal game. Maybe Nintendo isn't saying anything because they are still getting ready for non-collectors release, but I dunno how high demand is for Trilogy since it is a re-release. Did you buy the game when you spotted in the clearance section? What system do you prefer? Glad you got your copy. I'm still surprised by this, not the fact the "collector's edition" was canceled, but more-so that they haven't said anything else about the games. Yea, the demand may have very well been lower, and maybe the metal case is the reason they have stopped production, but for the sake of all the new Wii owners, I do hope they make it available somehow. Every wonder where all the millions of people making a living on Ebay get their products? I am also lucky to have got mine online. I must agree with you that this is a really great game and I enjoy playing it all the time. Thank you for sharing with us very informative posts about old school games! These games definitely goes well with a cup of coffee made from my new french press Regards! Yes, I bought the game and interestingly, since I figured out what was going on, I've been really enjoying it. How far are you into the game(s)? Same as Michael, how far have you made it? Forgot to specify I got my copy at its release date because I reserved it. I've enjoyed both games and when Corruption arrived, I was thinking about Prime 1 being played with the Wii Remote (same for Echoes with the Amorbis fight). That's crazy. Anyway, I still play it and I don't get bored. Ok, it might be easy but not that much too. Have you beaten all three games in the collector's edition? My brother got a copy, so im not going to be in a hurry to get it or anything. I've heard rumors of a new metroid prime game coming soon, is this true or is it among the many other fakes? I'm the one who bought the game and wasn't really enjoying it at first, but then I started getting into it. I've been playing the first game for an hour or two for most days over the last few weeks and I think all I have to do now is get the artefacts (I've stumbled on two, ten to go). It's been great fun. The pack is excellent value, especially for someone who hadn't played Metroid since the NES. The new Metroid game, known as Metroid: Other M, is true and it's scheduled to be released on June 27, 2010 in North America. I have Metroid Prime Trilogy, but I haven't even opened it yet! I played through Metroid Prime 3: Corruption four times and I still think that is Nintendo's best game on the Wii(out of Mario and Zelda). Metroid Prime and Echoes were so much easier to control with the Wii remote system. They should have ditched the Gamecube versions and continued with Metroid Trilogy! I wish I would have taken a copy when they were on sale now. I had my eye set on a few other games at the time. I didn't know they had discontinued it. However, I just picked up a brand new sealed copy of it at my local game shop. $35, but damn it's awesome! You all are so lucky to get it when It came out. A week ago I saw it at game stop last week but didn't know it had come out over a year ago! I realized that it was rare and went back but it was gone. Now I'll have to pay over $80 for it. But right now it seems pretty cheep compared to $180. too bad to see more and more old school games being discontinued... i guess gaming companies tend to believe that if their games aren't using cutting edge graphics or any other high end features that customers aren't willing to spend money on them. but hey to be honest all those mega advanced playstation, xbox games etc are often times a little too much for myself. sometimes i even think back to the good old c64 days =) all i need to be happy is a good old school game and a good cup of coffe made by a Tassimo T65 and i am all set! I think this is Fantastic collection! !